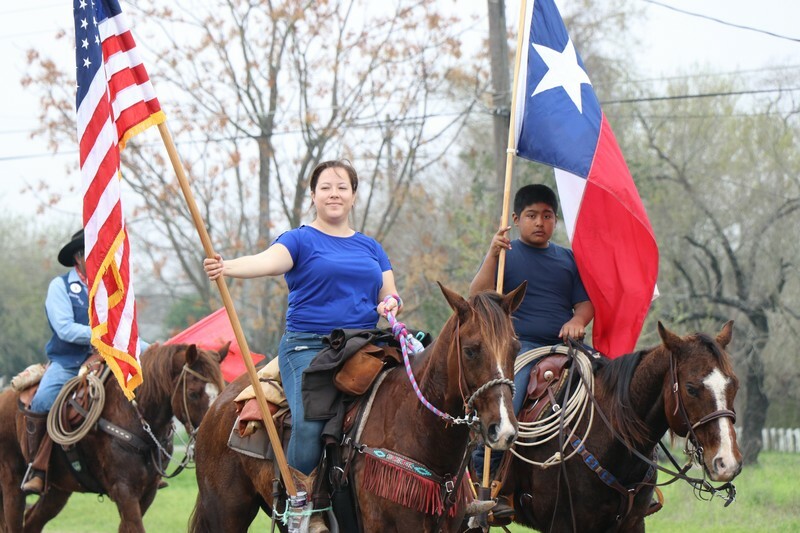 Click here to see over 100 photos of the Laredo Trail Ride as it its way through Devine on Feb. 5. In 1962 Archie Paige along with the help of the Medina County Trail Riders, decided to make another leg of the San Antonio Stock Show and Rodeo Trail Rides that promote and advertise the San Antonio Stock Show and Rodeo. Original members included Rodney Mangold, Marvin Hause, Babe Gilliam, and others. They originally began their trek at the international bridge between Laredo and Nuevo Laredo. At that time, the ride was approximately 210 miles long. Through the years, because of tick bans, and various other logistics, the trail ride now starts 10 miles south of Artesia Wells at the Oscar Moreno ranch. Current Trail Boss Jerry Chessher follows a long line of trail bosses. His father Jerry Chessher Sr, and his grandfather Jimmie Chessher were all trail bosses through the years, past trail bosses also included Missy Sultenfuss Floyd McOsker, Roy Jarvis and Archie Page. This February the Laredo Trail Ride celebrates 57 years of this grand tradition. Tonight, Wednesday, February 6 they stopped in Lytle, TX for a panoramic picture and then departed for a night stop at Country Gold Dance Hall for a dinner and dance, the public is invited. Thursday night they will be at the Morlandt Electric Co, and Friday theywill be meeting South Texas Trail Riders for their final leg into the official Stock Show Grounds. Their trail ride starting point was at the Oscar Moreno Ranch once again with a kick-off party on Friday, February 1. The Saturday night stop was in Cotulla, Tx; with dinner and dance at the American Legion grounds. The public was invited. The Sunday night stop was at the Dilley Lions Club. Monday night the stop was at the A&D Ballroom in Pearsall, Tx for a dinner and dance, the public was invited. Tuesday night they stopped at the Naeglin Ranch outside of Lytle, Texas. 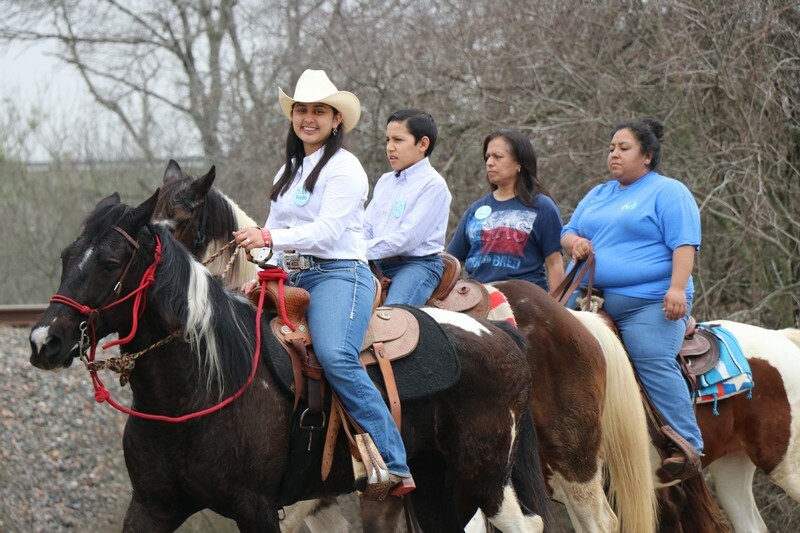 Any young single cowgirls between 16 to 20 years old is invited to participate in our Laredo Trail Ride Queen Contest. Theylook forward to promoting the San Antonio Stock Show and Rodeo throughout South Texas, and hope that community will come out to greet the Trail Riders, and join them at their dinners and dances. For more information call Trail Boss Jerry Chessher at 210-607-0762, or Missy Sultenfuss the Ride Coordinator at 210-219-6409, or look them up on Facebook under Laredo Trailride. Click here to view over 100 photos of the 2019 Cabalgata INTL La Grande Trail Ride as it passed through Devine.